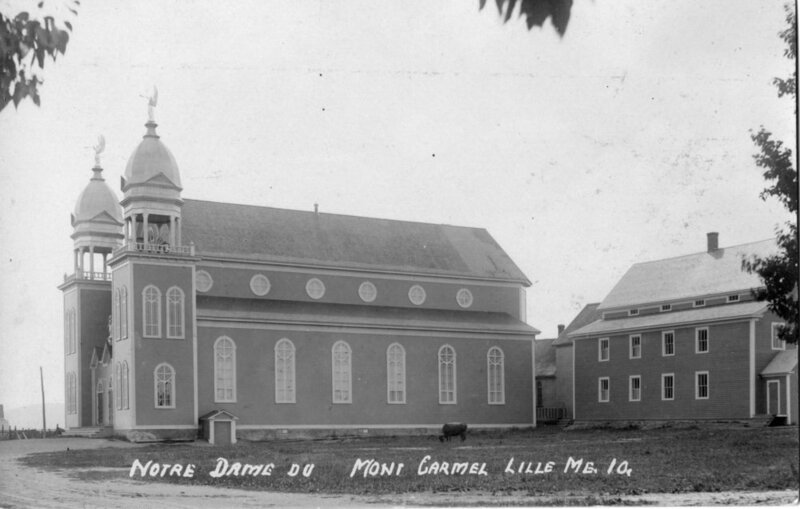 In 1908, Father Elphege Godin, of the church of Notre-Dame-du-Mont-Carmel (Our Lady of Mount Carmel), commissioned Théophile Daoust, an architect from Montréal, to design a new church. 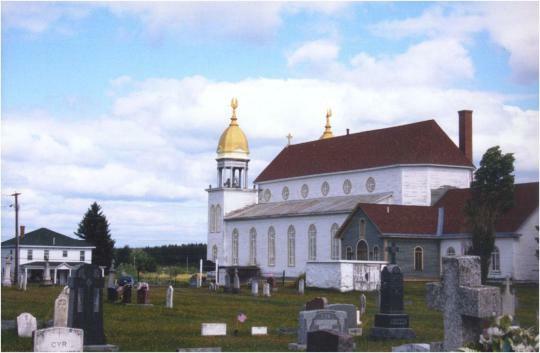 This was the third church sanctuary built by the congregation in Aroostook County, and the second on the site in Lille. Godin hired contractor Léonide Gagné of Edmundston, New Brunswick to start the building in 1908. Gagné simplified some of Daoust’s plans, making them more suitable to local tastes. This changed the overall style from Romanesque to Ancient Roman. The new church was completed in 1910. 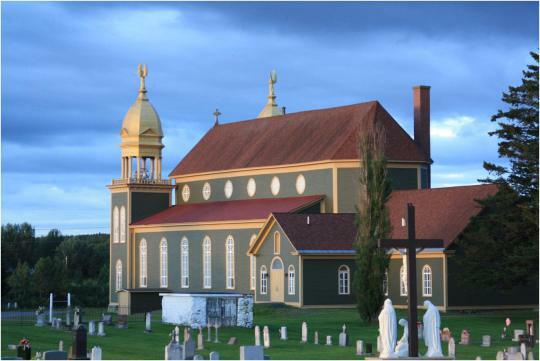 It is the most intact and architecturally significant of the surviving historic wooden Catholic churches constructed in the Acadian settlement along the St. John River. The church commissioned Louis Jobin of Sainte-Anne-de-Beaupré, Québec to carve the two trumpeting archangels that adorn the double belfries. He carved the figures in pine and covered them in hammered zinc. Inside the church, the plastered walls were decorated with garlands of maple leaves surrounding the arches, windows, and ceilings on the side aisles. All arches had gold leaf ribbon banding, and the blue ceiling of the apse was covered with thousands of gold-leaf stars. 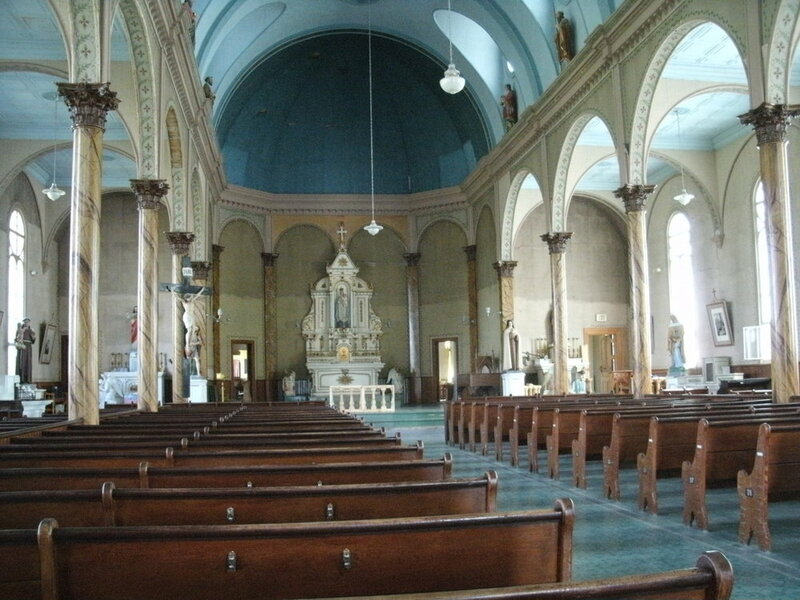 By the 1930s, the financial strains of the Great Depression, along with the establishment of a new, competing parish in nearby Grand Isle, began a series of difficulties for the Mont-Carmel church. The church was eventually closed in 1977 due to lack of finances. 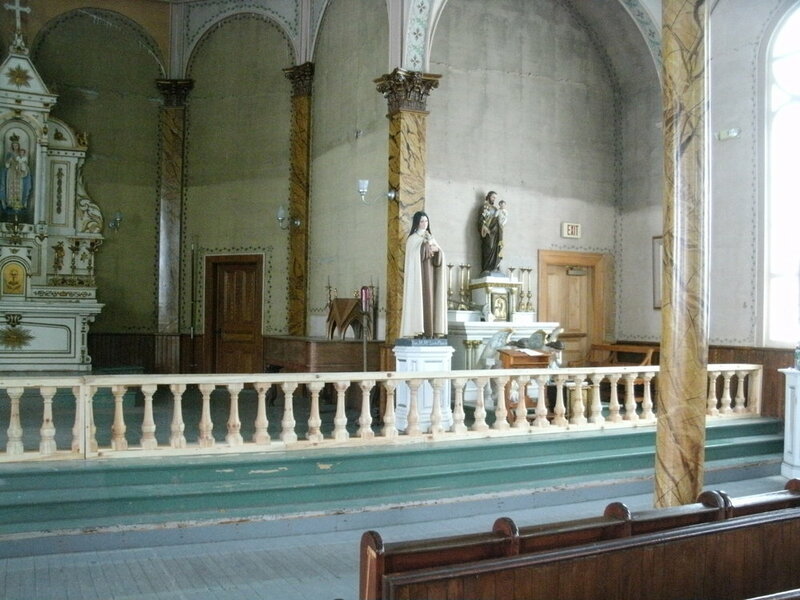 It remained closed for five years before the Bishop of Portland decided to donate the building to the L’Association Culturelle et Historique du Mont-Carmel, a nonprofit started by Joseph Donald Cyr (longtime Advisory Trustee to Maine Preservation) in 1983 for the purpose of saving the structure. Don Cyr began by removing the church’s “modern improvements.” In 1990, he hired contractor Terry Helms to work on the restoration. Over the years, Helms has worked tirelessly to restore the building, carefully following the Secretary of the Interior’s Standards. In a region of Maine with little funding available, the Association has written hundreds of grants to raise $2.8 million for the restoration project. Under the stewardship of Don Cyr and the Association, the church has become a museum housing fine Acadian artifacts, as well as a performing arts center. 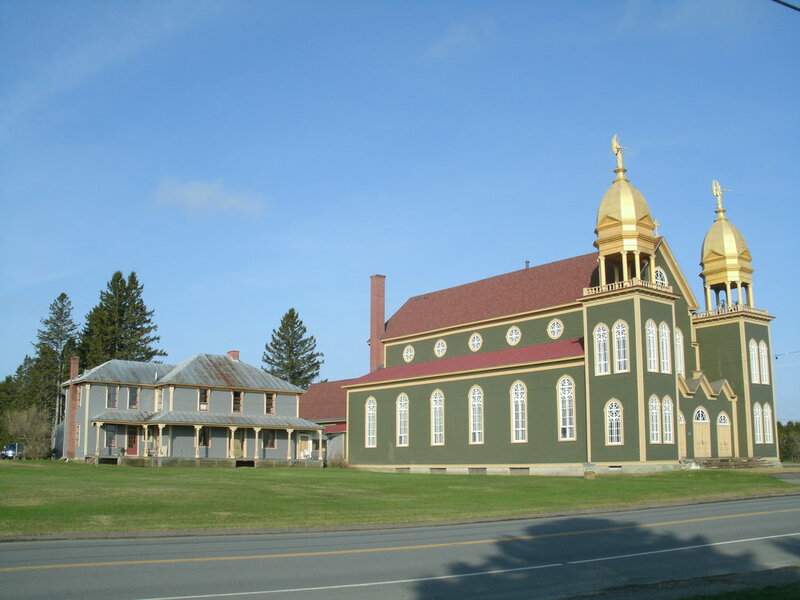 The church was open this summer for visitors to the World Acadian Congress. Terry Helms has replaced the sills on the museum and rectory, restored 52 historic windows, and painted the entire facade. 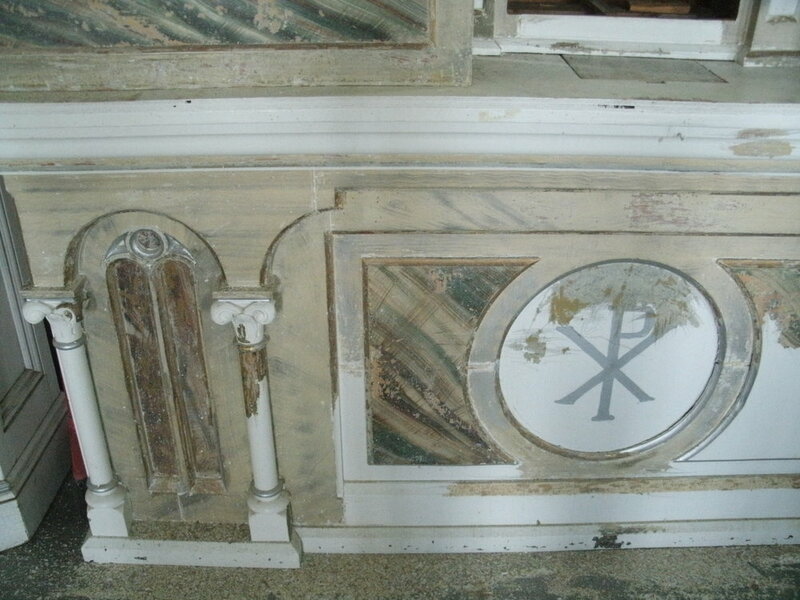 He has revealed original stenciled finishes by removing interior zinc panels and by scraping one layer of paint off wood trim, chapel walls and ceilings. He also has helped reproduce the two trumpeting archangels, mounted them on the towers, painted the towers, and restored their balustrades. 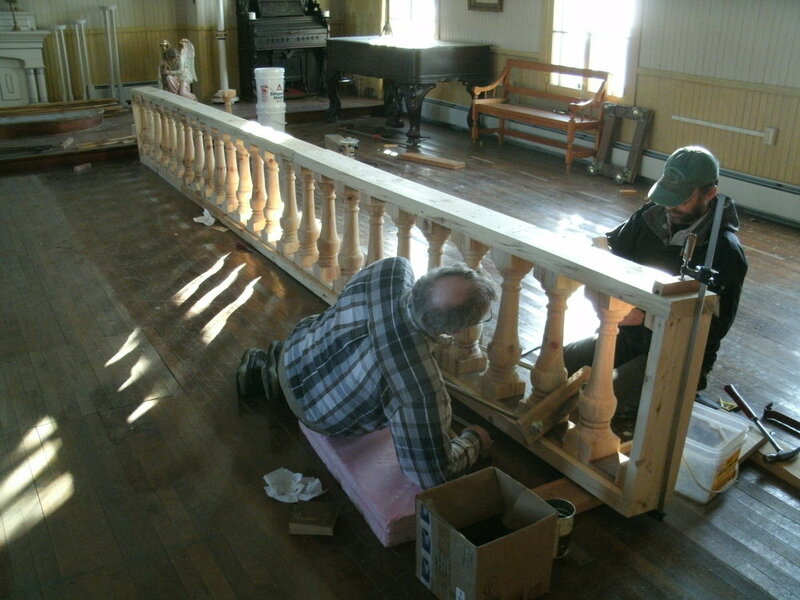 He has also restored the communion rail from original remnants. For their outstanding long-term efforts to preserve and restore this significant community asset in the small village of Lille, Maine Preservation is pleased to present Joseph Donald Cyr and Terry Helms with a 2014 Honor Award for Outstanding Service.